For your Seder, try a variation on the traditional matzo ball soup. Every family has its favorite Passover Seder recipes, forged from tradition, taste preferences and the seasonal availability of ingredients. Brisket often makes an appearance, though salmon, lamb and even veal spareribs can fit the bill for Passover, which begins at sundown on Monday, April 14. Accompany the soup with meat, potato and other side dishes—such as the following recipe for simple braised spring vegetables—and plenty of kosher wine. Producers around the world are now making top-quality bottlings in all styles and price ranges; we recommend a few wineries to seek out. 1. In a large stock pot, combine the stock or broth, the onion, 1 carrot, the celery, garlic, bay leaf and peppercorns and bring to a boil. Reduce to a simmer and add the turkey or chicken. Cover and simmer until the meat is completely cooked through: 30 minutes for chicken thighs, 45 minutes for turkey thighs, about 60 to 90 minutes for the whole chicken. Remove the meat from the pot and let cool. (If using a whole chicken, remove the meat from the bones and discard the bones and skin.) Cover the meat with plastic wrap and set aside. 2. Strain the hot broth into a clean pot to remove the vegetables, bay leaf and peppercorns. 3. In a large bowl, combine the matzo meal, salt, pepper, garlic powder and onion powder and whisk well to create a homogenous mixture. 4. Crack 3 of the eggs into a separate bowl, then add the yolks of the remaining 3 eggs, keeping the whites in a third bowl. To the egg and yolk mixture, add the 1/3 cup chicken fat, coconut oil or vegetable oil and whisk well to combine. Using a clean, dry whisk or electric mixer, whip the egg whites to stiff peaks. 5. Stir the egg and fat mixture, the seltzer, the chopped dill and 1 tablespoon of the chopped parsley into the matzo meal mixture, then gently fold in the whites. Cover the mixture tightly with plastic wrap and refrigerate for 30 minutes. 6. Bring the strained broth to a simmer and add the remaining 2 carrots. Use a tablespoon to form small balls from the matzo mixture. Gently add the balls to the broth. (Make sure to form all of the balls before adding them to the broth so that they all cook at the same rate.) They will expand in the broth, so you may need to work in batches to avoid overcrowding the pot. Cover the pot tightly and cook for about 35 minutes, until the balls are cooked through and fluffy. 7. While the soup cooks, shred or slice the meat as desired; if using a whole chicken, discard the skin and bones. 8. 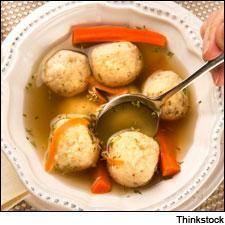 Once the matzo balls have cooked through, divide them among the serving bowls and add a portion of meat to each bowl. Pour the hot broth over, garnish with the remaining chopped parsley, and serve hot. Serves 10. This simple dish relies on a layering technique, in which ingredients are added 1 or 2 at a time so that each is perfectly cooked through and none are overcooked. While spring fever is in the air and winter-weary cooks and diners are clamoring for the freshest new baby vegetables, don't despair if they're still months away in your area. All of the ingredients in this recipe are easily sourced from your local supermarket year-round, with the possible exception of asparagus. If you can't find good-looking asparagus, you may substitute frozen artichoke hearts or a few handfuls of chopped spinach, chard or escarole. 1. In a large skillet, heat the oil over medium heat and add the onions. Stir well to coat with the oil and season well with salt and pepper. Cook the onions over medium heat, stirring occasionally, until they are soft and caramelized, about 15 minutes. 2. Stir in the garlic and wine, bring to a boil and cook until the liquid is reduced by half. 3. Add the stock, carrots and potatoes, reduce heat to medium, cover and cook for about 10 minutes. Stir in the mushrooms, cover and cook for 4 minutes, then stir in the asparagus and cook for another 4 minutes. Season the mixture with salt and pepper to taste, squeeze the lemon juice over and serve. Serves 10. The contrasting elements of the dishes above—light spring vegetables braised with rich caramelized onions, and fluffy matzo balls in a hearty turkey broth—mean that both white and red wines are welcome at the table. The following kosher producers make wines that have been consistently well-rated by our editors. • Daltôn, a winery in the Upper Gallilee region of Israel, has a track record of rich, well-crafted Chardonnays and Viogniers, and fruity Sauvignon Blancs. Cabernet- and Syrah-based wines top its list of reds. • Golan Heights Winery, another Israeli-run producer, makes ripe and spicy Chardonnays and creamy Viogniers. It also offers a diverse lineup of reds, including Cabernet Sauvignon, Merlot, Pinot Noir and Syrah. • In California, Covenant creates small amounts of elegant, clean and focused kosher Chardonnays and Sauvignon Blancs in Sonoma's Russian River and Dry Creek valleys and Sonoma Mountain, along with high-end Napa Cabernets. • Baron Herzog makes easy-drinking Chardonnays, Chenin Blancs and Sauvignon Blancs from California's Central Coast and Clarksburg, along with reds such as old-vine Zinfandel. • Alexander, in Israel's Hefer Valley, makes ripe and concentrated Cabernet Sauvignons, Syrahs, Merlots and blends. • Domaine du Castel makes ripe, muscular Bordeaux-style blends in Israel's Judean Hills region, along with rich Chardonnays. • Recanati focuses on high-altitude vineyards for its Cabernets, Merlots, Syrahs, Carignans and blends; its lineup also includes good rosés and whites. • In Spain, Capçanes makes firm, expressive blends using Cabernet Sauvignon, Garnacha, Carignan and other grapes. • In France's southern Rhône region, Vignobles David makes kosher Côtes du Rhône blends that are tangy, ripe and lively.